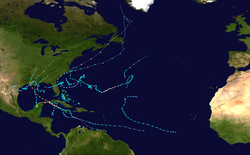 Hurricane tracks from 1980 through 2014. Green tracks did not make landfall in US; yellow tracks made landfall but were not major hurricanes at the time; red tracks made landfall and were major hurricanes. The Atlantic hurricane season is the period in a year when hurricanes usually form in the Atlantic Ocean. Tropical cyclones in the North Atlantic are called hurricanes, tropical storms, or tropical depressions. In addition, there have been several storms over the years that have not been fully tropical and are categorized as subtropical depressions and subtropical storms. Even though subtropical storms and subtropical depressions are not technically as strong as tropical cyclones, the damages can still be devastating. Worldwide, tropical cyclone activity peaks in late summer, when the difference between temperatures aloft and sea surface temperatures is the greatest. However, each particular basin has its own seasonal patterns. On a worldwide scale, May is the least active month, while September is the most active. In the Northern Atlantic Ocean, a distinct hurricane season occurs from June 1 to November 30, sharply peaking from late August through September; the season's climatological peak of activity occurs around September 10 each season. This is the norm, but in 1938, the Atlantic hurricane season started as early as January 3. Tropical disturbances that reach tropical storm intensity are named from a pre-determined list. On average, 10.1 named storms occur each season, with an average of 5.9 becoming hurricanes and 2.5 becoming major hurricanes (Category 3 or greater). The most active season was 2005, during which 28 tropical cyclones formed, of which a record 15 became hurricanes. 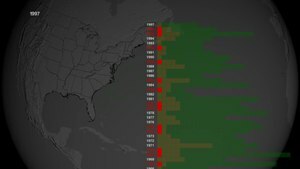 The least active season was 1914, with only one known tropical cyclone developing during that year. The Atlantic hurricane season is a time when most tropical cyclones are expected to develop across the northern Atlantic Ocean. It is currently defined as the time frame from June 1 through November 30, though in the past the season was defined as a shorter time frame. During the season, regular tropical weather outlooks are issued by the National Hurricane Center, and coordination between the Weather Prediction Center and National Hurricane Center occurs for systems which have not formed yet, but could develop during the next three to seven days. The basic concept of a hurricane season began during 1935, when dedicated wire circuits known as hurricane circuits began to be set up along the Gulf and Atlantic coasts, a process completed by 1955. It was originally the time frame when the tropics were monitored routinely for tropical cyclone activity, and was originally defined as from June 15 through October 31. Over the years, the beginning date was shifted back to June 1, while the end date was shifted to November 15, before settling at November 30 by 1965. This was when hurricane reconnaissance planes were sent out to fly across the Atlantic and Gulf of Mexico on a routine basis to look for potential tropical cyclones, in the years before the continuous weather satellite era. Since regular satellite surveillance began, hurricane hunter aircraft fly only into storm areas which are first spotted by satellite imagery. During the hurricane season, the National Hurricane Center routinely issues their Tropical Weather Outlook product, which identifies areas of concern within the tropics which could develop into tropical cyclones. If systems occur outside the defined hurricane season, special Tropical Weather Outlooks will be issued. Routine coordination occurs at 1700 UTC each day between the Weather Prediction Center and National Hurricane Center to identify systems for the pressure maps three to seven days into the future within the tropics, and points for existing tropical cyclones six to seven days into the future. Possible tropical cyclones are depicted with a closed isobar, while systems with less certainty to develop are depicted as "spot lows" with no isobar surrounding them. The North Atlantic hurricane database, or HURDAT, is the database for all tropical storms and hurricanes for the Atlantic Ocean, Gulf of Mexico and Caribbean Sea, including those that have made landfall in the United States. The original database of six-hourly positions and intensities were put together in the 1960s in support of the Apollo space program to help provide statistical track forecast guidance. In the intervening years, this database — which is now freely and easily accessible on the Internet from the National Hurricane Center's (NHC) webpage — has been utilized for a wide variety of uses: climatic change studies, seasonal forecasting, risk assessment for county emergency managers, analysis of potential losses for insurance and business interests, intensity forecasting techniques and verification of official and various model predictions of track and intensity. HURDAT was not designed with all of these uses in mind when it was first put together and not all of them may be appropriate given its original motivation. HURDAT contains numerous systematic as well as some random errors in the database. Additionally, analysis techniques have changed over the years at NHC as their understanding of tropical cyclones has developed, leading to biases in the historical database. Another difficulty in applying the hurricane database to studies concerned with landfalling events is the lack of exact location, time and intensity at hurricane landfall. HURDAT is regularly updated annually to reflect the previous season's activity. The older portion of the database has been regularly revised since 2001. The first time in 2001 led to the addition of tropical cyclone tracks for the years 1851 to 1885. The second time was August 2002 when Hurricane Andrew was upgraded to a Category 5. Recent efforts into uncovering undocumented historical hurricanes in the late 19th and 20th centuries by various researchers have greatly increased our knowledge of these past events. Possible changes for the years 1951 onward are not yet incorporated into the HURDAT database. Because of all of these issues, a re-analysis of the Atlantic hurricane database is being attempted that will be completed in three years. In addition to the groundbreaking work by Partagas[context? ], additional analyses, digitization and quality control of the data was carried out by researchers at the NOAA Hurricane Research Division funded by the NOAA Office of Global Programs. This re-analysis will continue to progress through the remainder of the 20th century. The National Hurricane Center's Best Track Change Committee has approved changes for a few recent cyclones, such as Hurricane Andrew. Official changes to the Atlantic hurricane database are approved by the National Hurricane Center Best Track Change Committee. • Texas-Louisiana Hurricane of 1886 (cat 3) Seven hurricanes struck the United States, the most during a single year. 19 11 2 2 Seven Tied for third most active season on record following very active 1886 season. • 1893 Cheniere Caminada hurricane (cat 4) 5 major hurricanes made landfall this year. Two hurricanes caused more than 2,000 deaths in the United States. Four simultaneous hurricanes on August 22, one of two times on record. NOTE: In the following tables, all estimates of damage costs are expressed in contemporaneous US dollars (USD). 7 3 2 8,000+ $60 million "Galveston" • Great Galveston Hurricane of 1900 (cat 4) The Galveston hurricane was the deadliest disaster in the United States. 1 0 0 0 Unknown One Least active season on record. One of two seasons with no recorded hurricanes. • New Orleans Hurricanes of 1915 (cat 4) Two cat 4 hurricanes made landfall in US in same year. Galveston last struck with major hurricane in 1900. • Great Texas Hurricane of 1916 (cat 4) 3 major hurricanes made landfall this year following a very active 1915 season. 6 4 1 4,000+ $952.5+ million "Okeechobee" • Great Okeechobee Hurricane of 1928 (cat 5) The Okeechobee hurricane is the only known hurricane to strike Puerto Rico at Category 5 strength. • Tampico Yucatán Hurricane of 1933 (cat 5) Second most active season on record following very active 1932 season. 9 4 2 ~700 $290.3 million "New England" • Long Island Express Hurricane (cat 3) Earliest starting season on record (January 3). Long Island express made landfall as a fast moving category 3. • Cape Sable Hurricane of 1947 [King] (cat 2) First year of Atlantic tropical cyclone naming. 14 7 3 1 $6 million Carol None First year of female names for storms. One of only 4 seasons to have both a preseason and postseason storm. 8 4 0 10 $10 million Gladys None The name "Edna" was retroactively retired, due to the storm in 1954. There was one subtropical storm with Category 1 hurricane strength. No major hurricanes, nor category 2 hurricanes. 18 12 5 364 $1.7 billion Camille Camille Fourth most active season on record. Tied for second most hurricanes in a season on record. 9 5 2 2,118 $4.3 billion David David, Frederic First year for alternating male/female names. 9 7 4 1 66 $27 billion Andrew Andrew Hurricane Andrew was the costliest U.S. hurricane until 2005. 13 13 9 6 179 $3.8 billion Edouard Cesar, Fran, Hortense Cesar was renamed Douglas after it crossed Central America. 14 14 10 3 12,000+ $12.2 billion Mitch Georges, Mitch Four simultaneous hurricanes on September 26, the first time since 1893. Hurricane Mitch was the deadliest hurricane in over 200 years. This bar chart shows the number of named storms and hurricanes per year from 1851–2018. A 2011 study analyzing one of the main sources of hurricanes - the African easterly wave (AEW) - found that the change in AEWs is closely linked to increased activity of intense hurricanes in the North Atlantic. The synoptic concurrence of AEWs in driving the dynamics of the Sahel greening also appears to increase tropical cyclogenesis over the North Atlantic. ^ This includes one subtropical hurricane that was not named at the time. ^ This includes one subtropical storm that was not named at the time. ^ This includes three subtropical storms that were not named at the time. ^ This includes two subtropical storms that were not named at the time. ^ This includes one tropical hurricane that was not formally named but was nicknamed "the Perfect Storm". ^ This does not include two additional tropical storm-force cyclones formed late in the season that may have been subtropical or tropical but were each reported by the NHC as extropical. ^ This does not include one subtropical hurricane that formed over the Great Lakes and was not formally named but was nicknamed "Huron". ^ This includes one tropical storm that was not named at the time. ^ This does not include one additional tropical storm-force cyclone over the Bay of Biscay that may have been subtropical but was reported by the NHC as extropical. ^ This does not include one subtropical storm that formed over the Mediterranean Sea and was not reported on by the NHC. ^ Landsea, Chris (contributor from the NHC). "Total and Average Number of Tropical Cylones by Month (1851-2017)". aoml.noaa.gov. National Oceanic and Atmospheric Administration, Atlantic Oceanographic and Meteorological Laboratory. Archived from the original on September 1, 2018. ^ a b Atlantic Oceanographic and Meteorological Laboratory, Hurricane Research Division. "Frequently Asked Questions: When is hurricane season?". NOAA. Archived from the original on July 18, 2006. Retrieved July 25, 2006. ^ McAdie, Colin (May 10, 2007). "Tropical Cyclone Climatology". National Hurricane Center. Archived from the original on May 28, 2007. Retrieved June 9, 2007. ^ Associated Press (June 15, 1941). "Hurricane Bureau Begins Season's Vigil Tonight". St. Petersburg Times. Retrieved July 9, 2011. ^ a b Associated Press (June 15, 1959). "1959 Hurricane Season Opens Officially Today". Meridian Record. Retrieved July 9, 2011. ^ Associated Press (June 15, 1955). "Hurricane Season Opens; New England Joins Circuit". The Robesonian. Retrieved July 9, 2011. ^ a b Associated Press (June 15, 1960). "1960 Hurricane Season Open As Planes Prowl". The Evening Independent. Retrieved July 9, 2011. ^ Neal Dorst (January 21, 2010). "Subject: G1) When is hurricane season ?". National Hurricane Center. Archived from the original on June 28, 2011. Retrieved July 9, 2011. ^ Brownsville Herald (June 1, 1965). Hurricane Season Officially Opened. ^ United Press International (May 30, 1966). "Hurricane Season Opens This Week". The News and Courier. Retrieved July 9, 2011. ^ National Hurricane Center (2011). "Atlantic Graphical Tropical Weather Outlook". National Oceanic and Atmospheric Administration. Archived from the original on June 23, 2011. Retrieved July 9, 2011. ^ United States Department of Commerce (2006). Assessment: Hurricane Katrina, August 23–31, 2005. Retrieved on 2008-09-03. ^ Hurricane Research Division (2008). "Chronological List of All Hurricanes which Affected the Continental United States: 1851-2007". National Oceanic and Atmospheric Administration. Retrieved March 21, 2008. ^ Dorst, Neal (October 23, 2012). "They Called the Wind Mahina: The History of Naming Cyclones" (PPTX). Hurricane Research Division, Atlantic Oceanographic and Meteorological Laboratory. National Oceanic and Atmospheric Administration. p. Slides 49–51.